Sometimes politics and patriotism combine to influence the development of a canine breed. Such is the case with the American Eskimo dog, which originated in Germany (where it was known as the German spitz) and was brought to America in the early 1900s as a companion and watchdog. However, with the rise of World War I and anti-German sentiment, the name was changed from German spitz to American Eskimo dog (and nicknamed the “Eskie”). The name wasn’t the only thing that changed. The American version of the breed, separated from the German, and perhaps mixed at some point with the Japanese spitz, developed into its own, primarily white, breed. Eskies were originally used as watchdogs, and as such still retain a tendency to bark at strangers that approach or encroach upon their territory. In America, they became popular as performing animals in circuses, walking on balls, tightropes and performing other tricks. Marketing gurus of the day sold puppies after the show and, as such, many families went home with their very own Eskie. Because they evolved as alert watchdogs and performing animals, Eskies are intelligent, affectionate, playful and biddable – they love to please. These personality traits make them perfect for obedience and agility trials, as well as hours of playing with the kids – making them ideally suited as a family dog. 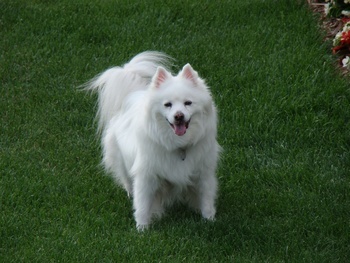 A small- to medium-sized white (or white with biscuit cream) dog, Eskies come in three sizes: toy (9 to 12 inches), miniature (over 12 inches to 15 inches) and standard (over 15 inches to 19 inches) – any American Eskimo dog under 9 inches or over 19 inches is considered a disqualification by the American Kennel Club. Their white hair is a double coat that consists of a short, dense undercoat, with a longer guard hair growing through it and forming the straight outer coat. The coat is thicker and longer around the neck and chest forming a lion-like ruff. The rump and hind legs, down to the hocks, are also covered with thicker, longer hair forming the characteristic breeches. The richly plumed tail is carried loosely on the back. The thick coat sheds prodigiously, so prepare accordingly. As a smaller breed, American Eskimo dogs enjoy a long lifespan – averaging 16 years – and they have relatively few serious genetic issues that are common. However, there are a few genetic mutations that do occur in the breed and should be tested for prior to breeding. At Paw Print Genetics, we offer an American Eskimo dog panel that includes the most common genetic issues they suffer from, including: degenerative myelopathy, primary lens luxation, progressive retinal atrophy (PRA-PRCD), Thrombopathia (Group A). Eskies are also prone to luxating patella and hip dysplasia, as well as obesity. Next to Papillons, they are the sweetest dog on the planet. Since mine came from a horrible and deplorable puppy mill, Chance has issues, but around the house, he is a clown and keeps me laughing.